Well it’s primary season once again, and that means lots of negative ads and political talking heads making their prognostications. But primary season also brings back the ever-exciting victory, “I exceeded expectations,” and the “Uh oh, I just fell flat, but let’s pretend I’m still positive” speeches by presidential candidates in front of a crowd of their loyal supporters. Who could forget Howard Dean’s infamous wild recitation of the order of the primary states after a disappointing defeat in Iowa in 2004. But no successful campaign rally is complete without the campaign anthem. Al Gore was serenaded by the apropos Paul Simon classic, “You Can Call Me Al” during his vice presidential campaign in 1992. John McCain opted for the traditional hit, “Johnny B. Goode” in 2008. Barack Obama used, among others, Stevie Wonder’s “Signed, Sealed, Delivered” to pump up his enormous crowds in 2008. Some of the campaigns may in fact be infringing on the copyrights of the songwriters of these hit songs; others may be licensed to play them. But in this divisive political climate, not all songwriters are overly thrilled that their tunes are being used to represent politicians with far different views than their own. According to section 106(4) of the Copyright Act, copyright owners of musical works have the exclusive right to publicly perform their copyrighted works. The Act’s definition of “perform” includes the playing of a musical work, “either directly or by means of any device or process.” “Publicly” is defined as “[performing] . . . it at a place open to the public or at any place where a substantial number of persons outside of a normal circle of a family and its social acquaintances is gathered,” or transmitting the performance to such a group. When campaigns play songs over the speakers at a venue, they are clearly publicly performing the songs; as much as the campaigns try to create the feel of a party amongst close friends, it is really a gathering of big donors and campaign volunteers. While most campaigns do not seek out a license to perform these songs directly from the artist who owns the copyright to the musical composition, they can usually avoid this by obtaining a license from a performance rights organization (PRO), such as ASCAP. A license from an organization such as ASCAP allows the licensee to perform or play the songs of any of the organization’s members, which include nearly all songwriters. Thus, once a songwriter joins ASCAP, he foregoes the right to protest a licensee’s performance of his songs, whether played on the radio or at a political event, in exchange for royalties. A cease and desist letter from the songwriter to the campaign will have no impact, as the campaign is legally authorized to play the song under the ASCAP or other PRO license. Many artists have found this problematic over the years. 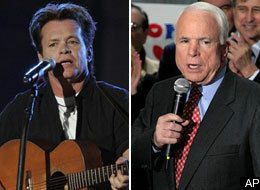 In 2008, John Mellencamp, a strong Democratic supporter, learned that John McCain was using his songs “Our Country” and “Pink Houses” at his campaign rallies. Rather than taking legal action, which would most likely have been futile, Mellencamp informally requested that McCain stop using his songs because they “have a very populist pro-labor message [and are] written by a guy who would find no argument if you characterized him as left of center.” Clearly, the themes of his songs were contrary to McCain’s conservative message. McCain’s campaign acquiesced, but did so more for public relations purposes, and as an attempt not to alienate the campaign from Mellencamp’s large fan base. McCain fared no better when he used ABBA’s “Take a Chance on Me,” as the Swedish pop group, according to McCain, apparently went “berserk” when they learned his campaign was using their song. McCain’s campaign finally settled on Chuck Berry’s “Johnny B. Goode.” Though Mr. Berry is a Democrat, he didn’t object to his song’s use by McCain. Perhaps Congress could look into this matter to cure the headache that both campaigns and songwriters encounter. After all, the venue where these political rallies are held may have PRO licenses, but in these national campaigns, the potential audience expands far beyond the crowd inside the venue because most cable news channels cover the speeches. These songs become associated with the campaigns, and with a political message that may be contrary to the songwriter’s core beliefs. This is usually not a concern that exists with most public performances, such as those on the radio, at a sporting event, or at a nightclub. The songwriter should not have to forego joining a PRO, which can be highly lucrative and beneficial to his or her career, to legally prevent a campaign from using his song. Maybe Congress can pass an exception for public performance licenses to political campaigns, and force the campaign to receive a license directly from the copyright owner, rather than the PRO. Josh Steinberg is a 2L at Fordham Law. He received a BA in Economics and Mathematics from Columbia University in 2008. He is interested in copyright law, but also worked in criminal law at the NYPD Legal Bureau and the New York City Mayor's Office.